V2557. 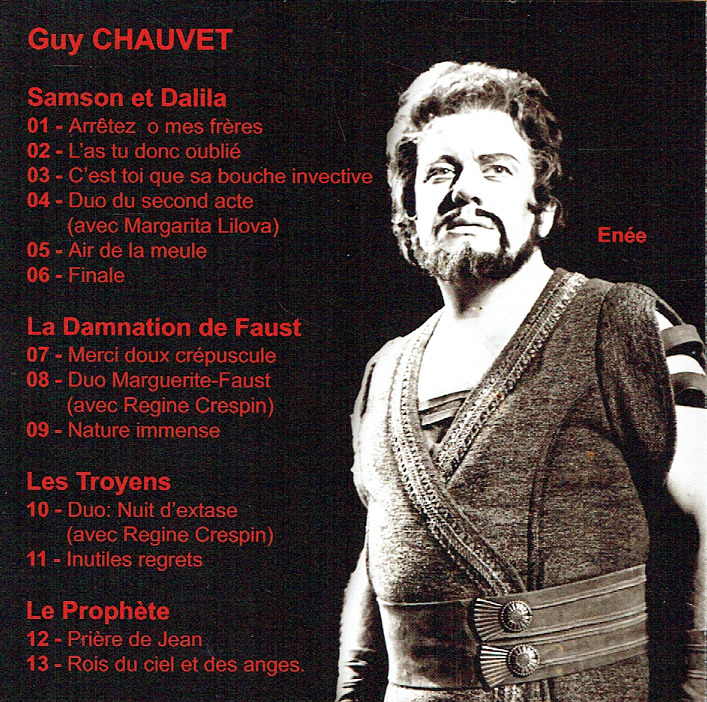 GUY CHAUVET: Arias & Scenes (w.Margarita Lilova & Regine Crespin) from Samson et Dalila, Les Troyens, La Damnation de Faust & Le Prophete. (France) Malibran 149. "This is a very welcome addition to the series covering those French tenors who were active in the post-Second World War period. Guy Chauvet was the youngest of what Jean Giraudeau (a noted tenor himself) and Jean Gourret in their comprehensive book LES PRESTIGIEUX TÉNORS DE L'OPÉRA DE PARIS termed 'La Dernier Vague' (The Last Wave). They were aware of the gradual decline in the number of fine tenors that used to dominate the French operatic scene during the first half of the 20th century. These transfers have been made from the personal collection of Chauvet's widow. Certainly the transfers vary in quality between the studio and live performances. This CD, without reserve, is enthusiastically recommended, for its contents display a remarkable tenor talent." "French tenor Guy Chauvet was co-winner of a tenor competition in Cannes, along with Alain Vanzo, Gustave Botiaux, Tony Poncet, and Roger Gardes - a pretty impressive assemblage of talent! 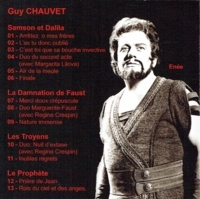 Chauvet made his Paris Opéra debut in 1959, starting with comprimario parts, finally advancing to lead roles. He soon established himself as an important presence, both in France and, ultimately, in many of the world's other major opera houses. He sang numerous roles in the French and Italian repertoire, and became particularly well-known for such heroic parts as Aeneas and Samson. 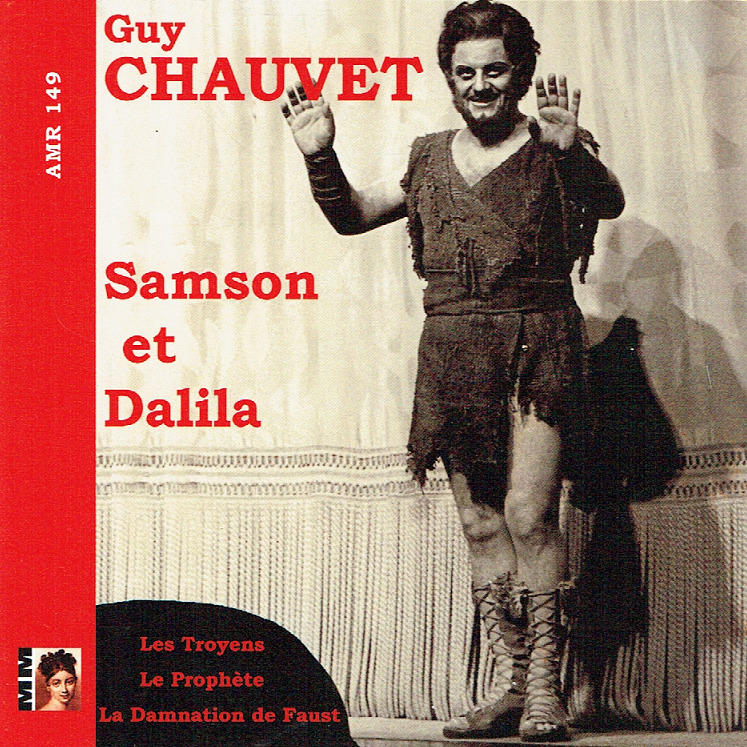 Guy Chauvet was without question a talented singer, and one who filled a pressing need during a time when the grand tradition of the French heroic tenor was in decline. Typical of this singer's work in general, the diction is idiomatic and crystal-clear. The sweetness of the young Chauvet's timbre is something to savor. In addition, Chauvet displays all of the other qualities that are the heart and soul of great French tenor singing - a seamless legato, a masterful application of the mixed voice, and an ideal balance between elegance and passion. And if all of these attributes inspire comparison to Chauvet's great predecessor, Georges Thill, the singing on this disc justifies such comparisons. We hear some absolutely first-rate French tenor singing. Highly recommended."